Petkin's PetWipes are fuss-free sanitary wipes suitable for cats and dogs alike. Infused with a skin-friendly cleansing lotion and gentle fragrance, each wipe is adept at dislodging daily dirt and banishing odours. Suitable for all over use, be it muddy paws or a dirty face, PetWipes won't interfere with spot flea treatments, and contain aloe vera and Vitamin E to condition your pet's coat. 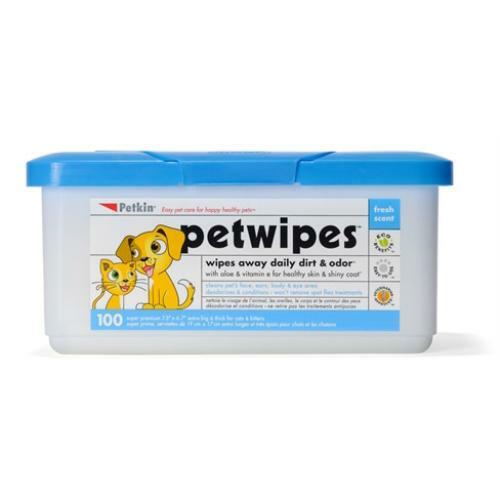 Completely non-toxic and puppy and kitten safe, these wipes are approved by veterinarians.